For this section we will turn our attention to the teachings contained in the Roman Catechism. Published hundreds of years ago, this book has summarized in an eloquent yet complete way the Church’s teachings on marriage as a Sacrament. “It will now be necessary to explain that Matrimony is far superior in its sacramental aspect and aims at an incomparably higher end. 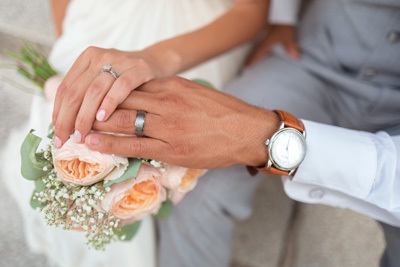 For as marriage, as a natural union, was instituted from the beginning to propagate the human race; so was the sacramental dignity subsequently conferred upon it in order that a people might be begotten and brought up for the service and worship of the true God and of Christ our Saviour. “Thus when Christ our Lord wished to give a sign of the intimate union that exists between Him and His Church and of His immense love for us, He chose especially the sacred union of man and wife. That this sign was a most appropriate one will readily appear from the fact that of all human relations there is none that binds so closely as the marriage, and from the fact that husband and wife are bound to one another by the bonds of the greatest affection and love. Hence it is that Holy Writ so frequently represents to us the divine union of Christ and the Church under the figure of marriage. “That Matrimony is a Sacrament the Church, following the authority of the Apostle, has always held to be certain and incontestable. In his Epistle to the Ephesians he writes: Men should love their wives as their own bodies. He that loveth his wife loveth himself. For no man ever hated his own flesh, but nourisheth it and cherisheth it, as also Christ doth the church; for we are members of his body, of his flesh, and of his bones. For this cause shall a man leave his father and mother, and shall adhere to his wife, and they shall be two in one flesh. This is a great sacrament; but I speak in Christ and in the church. Now his expression, this is a great sacrament, undoubtedly refers to Matrimony, and must be taken to mean that the union of man and wife, which has God for its Author, is a Sacrament, that is, a sacred sign of that most holy union that binds Christ our Lord to His Church. “That this is the true and proper meaning of the Apostle's words is shown by the ancient holy Fathers who have interpreted them, and by the explanation furnished by the Council of Trent. It is indubitable, therefore, that the Apostle compares the husband to Christ, and the wife to the Church; that the husband is he... Please purchase this lesson to continue learning.